Which brings us to the topic of today’s post: place. Some people are born to a place. Others create it. The winners of the 2015 Levitt AMP [Your City] Grant Awards fall into this second category. They are creators and activators, transforming underused sites—like a neglected horse farm in Lafayette, La., and abandoned railroad tracks in Cleveland, Miss.—into lively, music-filled community hubs as part of the inaugural Levitt AMP [Your City] Music Series. Here at Levitt Pavilions, we empower communities across the nation to transform neglected outdoor spaces into welcoming destinations through the power of free, live music. This summer marks a new chapter in Levitt’s history. Following an online public voting period and an application review process last fall, Levitt Pavilions and the Mortimer & Mimi Levitt Foundation awarded $250,000 in matching funds to 10 nonprofits serving small and mid-sized towns and cities across America, to present free outdoor concerts as part of the first-ever Levitt AMP [Your City] Grant Awards. The 2015 winners hail from Anchorage, Alaska; Bellingham, Wash.; Charlottesville, Va.; Cleveland, Miss. ; Denison, Texas; Frederick, Md. ; Lafayette, La. ; Middlesboro, Ky.; Sheboygan, Wis.; and Trenton, N.J.
With Levitt AMP, we’ve been introduced to 10 special places ripe for transformation. Each Levitt AMP site is centrally located within towns and cities rich in history, tradition and, most importantly, local pride. Today, we celebrate those places. Across the country we’re seeing a renewed interest in downtown community life, signaling the reversal of long-time urban sprawl and center city disinvestment, two patterns that became widespread amongst U.S. cities beginning in the 1970’s. 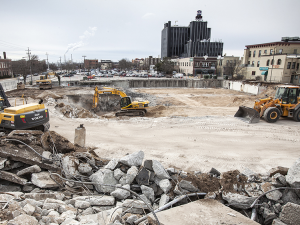 Sheboygan, Wis., residents are already seeing a dramatic transformation at the future site of the Levitt AMP Sheboygan Music Series. The large abandoned retail space formerly known as the Boston Store—which stood between the John Michael Kohler Arts Center and the rest of the city’s downtown—is nearly demolished. By this summer, a green, music-filled corridor will sit in its place, connecting people and nearby cultural organizations. With the former Boston Store no longer standing as a barrier, the city of Sheboygan hopes Levitt AMP will serve as the catalyst to launch an arts hub in their city. Meanwhile, in Denison, Texas, the Levitt AMP Denison Music Series will attract residents to the existing downtown green space, Heritage Park, where an expanded version of the much-loved “Music on Main” concert series will take place. In a similar vein, in Anchorage, Alaska, the Levitt AMP Anchorage Music Series will infuse energy into their downtown’s dormant Town Square Park. Several Levitt AMP winners have already experienced the benefits of creative placemaking in their own backyards and the Levitt AMP Music Series will add further momentum to up-and-coming downtown arts spaces and districts. 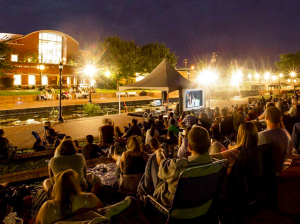 The Levitt AMP Charlottesville Music Series will be set in the city’s downtown IX Art Park. 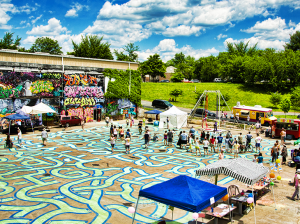 This eccentric multi-use community destination is filled with murals, sculptures and a regular rotation of projects and exhibitions that encourage “spontaneous dreaming” and interactions among people. The Levitt AMP Bellingham Music Series Bay Street site is in the heart of downtown Bellingham’s Arts District, a recently refurbished area that draws increasingly larger crowds every year. Levitt AMP Bellingham will build upon “Downtown Sounds,” a series that was launched 10 years ago in an underutilized alley, and has grown into its more expansive and accessible Bay Street location. Often times, learning about the past brings deeper meaning to the present—particularly in Trenton, N.J., Frederick, Md. and Cleveland, Miss., whose Levitt sites have historical significance. The Levitt AMP Trenton Music Series will take place on Capitol Green—a neglected three-acre lot in the city center surrounded by national public treasures: the War Memorial, which honors Mercer County’s World War I soldiers; Petty’s Run, the country’s only pre-revolutionary steel mill available for public viewing; and the Old Barracks, which housed soldiers during the pivotal American Revolutionary Battle of Trenton in 1776. A different type of historical struggle links the Levitt AMP Music Series sites in Frederick and Cleveland: racial segregation. Historically, Frederick’s Carroll Creek served as a physical dividing line between the city’s African-American communities in the south and white communities in the north. The Levitt AMP Frederick Music Series will further the city’s efforts to transform Carroll Creek Park into a welcoming communal environment for all Frederick residents to enjoy. Like many other southern towns, for Cleveland it was a railroad track that divided communities along racial lines. In 1999, Cleveland railbanked the portion of the Yazoo and Mississippi Valley railroad corridor that ran through downtown Cleveland and built Crosstie Walk—also known as the Downtown Walking Trail. Cleveland’s railroad tracks, which once divided the city, will now serve as the backdrop for the Levitt AMP Cleveland Music Series and give diverse communities a gathering place where they can come together to enjoy free, live music. Each of the Levitt AMP cities is home to residents with tremendous local pride. In each city, community members have joined forces to create new energy in their hometown, reminding us that it takes a shared passion to transform a space into a thriving place. Prior to receiving the Levitt AMP Grant Award, hundreds of volunteers in Middlesboro, Ky., were already working together to energize their downtown—assisting with pop-up parks, pop-up shops, parklets and their much-loved pop-up Makers Market. This summer, residents will come together for the Levitt AMP Middlesboro Music Series, amplifying this new level of energy in their city. 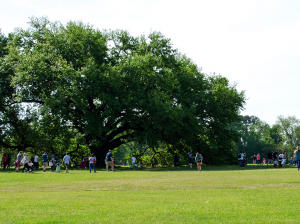 Community members in Lafayette, La., also demonstrated their ability to come together for their city prior to receiving the Levitt AMP Grant Award. The Park at the Horse Farm, the site of the Levitt AMP Lafayette Music Series, is the last expansive piece of undeveloped land in central Lafayette. In 2005, a citywide movement to save the Horse Farm was launched when the public learned the land was under threat of commercial development. Thanks to the communal effort, the park’s rolling green acres have been preserved and protected for years to come. We’re deeply inspired by all of the Levitt AMP winners who’ve demonstrated a love for the place they call home. Nationwide, the Levitt AMP Music Series will create connections among people of all ages and backgrounds, amplifying community pride. Here’s to communities across the country coming together to enliven the places they love, while enjoying some fantastic free, live music! I am so impressed with all of the beautiful work you are doing for our cities and for our country. I love Levitt Pavillions and am blown away by your plans and your mission for Levitt AMP! I can’t believe how it’s all growing..